After 19 races and eight different winners, the culmination of a thrilling world championship will be played out at the Brazilian Grand Prix. Interlagos has so often been the maker and breaker of many a drivers' title dreams and so it will be once again as Red Bull's Sebastian Vettel and Ferrari's Fernando Alonso prepare to battle it out for a historic third world championship. The mixture of fast and slow corners, elevation changes and the high altitude level of the circuit all combine to make Interlagos one of the most technically challenging circuits on the Formula 1 calendar. The 4.309km circuit is one of the few that runs in an anti-clockwise direction, consequently providing a different physical test for drivers who are not used to the significant G-force they will feel on the left side of their bodies. There are at least four places where overtaking is possible, with the best two passing opportunities at the Senna S at the end of the pit straight and on the back straight. Scruffy and crumbling in places, Interlagos is an ageing circuit, but nevertheless one that is full of character and loved by drivers and fans alike. The name Interlagos roughly translates as "between lakes" which comes from the fact that it was built in a region between two large artificial lakes, Guarapiranga and Billings. It was renamed Autodromo Jose Carlos Pace in 1985 in honour of the Brazilian F1 driver Jose Carlos Pace, who died in a plane crash in 1977. Mercedes driver Michael Schumacher: "Interlagos is the right place to round off my career because so much of the fascination of Formula 1 is rooted there. I always enjoy the enthusiasm of the fans, and it's simply a great circuit which has seen many memorable events and always produces spectacular races as the unique layout guarantees plenty of action." Red Bull driver Sebastian Vettel: "At Interlagos you have a combination of passionate fans, driving anti-clockwise, bad bumps and extreme altitude. The long left turns put an extreme burden on our neck muscles, because of the centrifugal forces that are created from driving anti-clockwise. So I'm doing special workouts for São Paulo to build up my neck muscles and get them used to it." Lotus driver Kimi Raikkonen: "There is no doubt about it; the greatest day of my career came at Interlagos when I won the World Championship in 2007 and that means I have very fond memories of this place. All in all it has been good to me. I have finished here every year since 2003 and been on the podium five times." Caterham driver Heikki Kovalainen: "It looks like there could be rain every day and that'll mean picking the right strategy will be key. The Brazilian race has one of the best atmospheres of the whole season. The fans are very knowledgeable and they turn the whole weekend into a giant party in the stands. It's pretty cool on Sunday when you're on the grid and all the stands are bouncing." Sauber driver Kamui Kobayashi: "I like Brazil! I like the Brazilians and I like the Churrascarias [Brazilian steakhouses]. Interlagos is the place where I drove my first Formula 1 race in 2009, and last year we were in a battle with Toro Rosso for seventh place in the championship, which we were finally able to defend." Just as it has this year, the battle for the world championship went down to the wire, with Lewis Hamilton and home favourite Felipe Massa both arriving at Interlagos with a chance of winning the title. A win for Massa, coupled with Hamilton failing to finish inside the top five, would hand the Brazilian the world championship. That was the scenario as Massa crossed the finish line but, on the third-last corner of the final lap, Hamilton dramatically overtook Timo Glock to go into the fifth place and ensure he snatched his maiden world title. Final practice: 13:00 GMT, 12:55 on Red Button, 5 live Sports Extra and online. 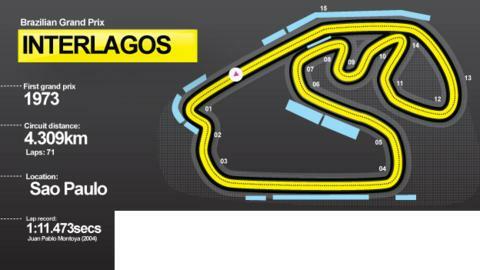 Qualifying: 16:00 GMT, 15:00 on BBC One, 16:25 on 5 live sports extra and online.